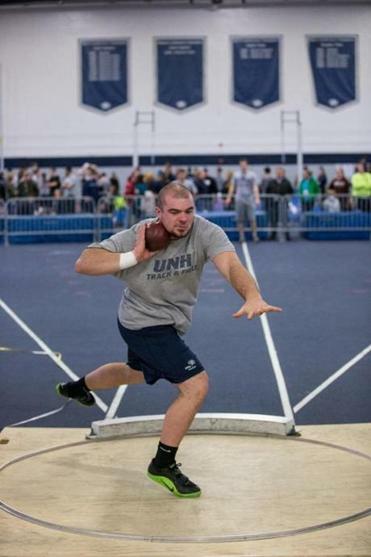 University of New Hampshire senior Cameron Lyle passed up a chance for a Division 1 gold medal in the shot put in order to donate bone marrow. Growing up an athlete in Plaistow, N.H., Cameron Lyle heard all the cliches about the importance of sacrifice and giving your all. For most of his career as a track and field star in high school and college, the sacrifices were relatively easy. Work out harder. Sweat more. Put that shot just a bit farther. Recently though, Lyle upped the ante, offically ending his college athletic career a bit early so he could donate bone marrow to a 28-year-old man suffering from a form of blood cancer called acute lymphoblastic leukemia. Lyle’s decision to donate came just days before his final chances at gold medals in the Division 1 America East Conference championships and the legendary Penn Relays, the oldest and most celebrated collegiate track and field competition in the country. Lyle had medaled 11 times at the conference level. Lyle, who turned 22 on May 1, will work in the marketing department at the Bank of New Hampshire Pavilion at Meadowbrook — his family’s business — after graduation. He registered to become a bone marrow donor two years ago and, until recently, had forgotten all about it. According to the National Marrow Donor Program, 12,000 blood cancer patients require marrow or umbilical cord blood transplants in the United States each year, and 70 percent of those patients don’t have donor matches in their families. Many patients rest their hopes on the 10.5 million potential donors in the Be the Match registry. Lyle thought no more about it until he got a call from Be the Match about two months ago. A follow-up test at a lab in Dover, N.H., confirmed that Lyle was indeed a match for the cancer patient. And the marrow harvesting surgery — “Now or never, they told me,” Lyle says — was scheduled for April 25, about a month shy of the end of his college career. The procedure, which involves puncturing two or three spots at the rear of the hipbone and extracting marrow, took about an hour and 15 minutes, says Lyle’s surgeon, Dr. Steven McAfee, clinical director of the Bone Marrow Transplant Program at Massachusetts General Hospital. The amount of marrow extracted varies, McAfee says, and in Lyle’s case the maximum was needed. Often a patient will need 5 or 10 cubic centimeters of donor marrow, but Lyle’s match needed far more. The next night, Lyle was home in his own bed, extremely sore and very weak, but otherwise fine. “I’ve never felt this much pain in my lower back before,” he said. “My girlfriend had to help me get dressed for a couple days.” It will still be a couple of weeks before he can lift more than 20 pounds. 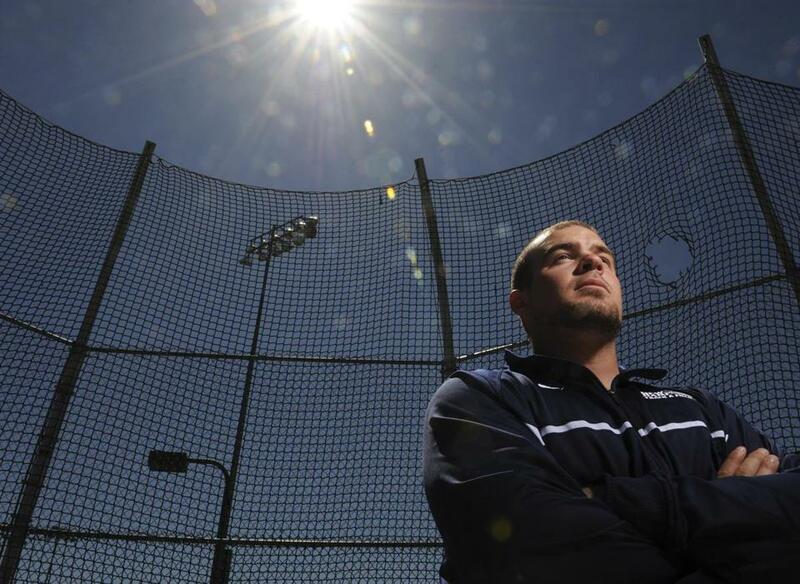 Jim Boulanger, the director of the UNH track and field program and Lyle’s coach, says in 30 years at the university, it’s only the second time he’s seen an athlete go through the procedure. Three years ago, Catie Perrella, also a member of the UNH track team, learned she was a match and donated marrow. Lyle says that when he learned he was a definite match, he felt just a smidgen of dread because he didn’t want to upset Boulanger by quitting the track team just before two major meets — his last two ever. Boulanger says it bothers him when people dismiss Lyle’s story as a kid just finishing sports a few weeks early. James H. Burnett III can be reached at james.burnett@globe.com. Follow him on Twitter @JamesBurnett.